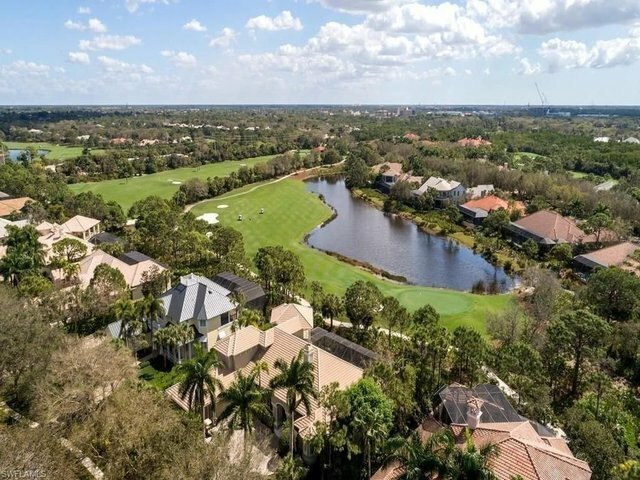 Calling all lake and golf view aficionados-don't let this opportunity pass you by! A light-filled great room-design home awaits, overlooking hole #15 of Arthur Hills' Audubon Sanctuary course. The over half-acre estate w/south rear exposure spoils with spectacular vistas from sunrise to sunset. This is relaxed Florida living at its best!The heart of your open-concept living is the light and airy great room with gas fireplace and fully equipped wet bar for entertaining, flowing seamlessly towards the dining room w/butler's pantry and towards the kitchen and casual dinette w/mitered bay window. High coffered ceilings shine by night wotj extensive cove lighting. Disappearing sliding glass doors invite to transition to a huge lanai, where expansive seating, lounging and sundeck areas frame an over-sized 40-foot gas-heated pool and spa.From the updated/upgraded kitchen with gas cook top you look out into a tranquil meditation garden to the east and the gorgeous golf and lake scenery beyond the lanai to the south. Your guests will love the cabana suite w/morning kitchen. From ample storage to an over-sized three-car garage, to hurricane shutters and a new roof, this luxury estate is sure to impress.